Belleek China cachepot bowl features Celtic knot work along with shamrocks. This Belleek bowl is the signed and dated 2005 edition piece. 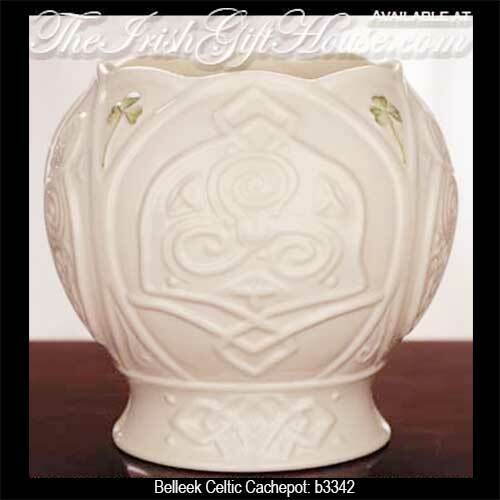 The Belleek cachepot features embossed Celtic knot-work and is enhanced with hand painted green shamrocks. This Belleek bowl is crafted of fine china and measures 5" tall x 5" wide. This Irish bowl is hand crafted in Belleek, Ireland and is gift boxed with Celtic knot and shamrock history cards, complements of The Irish Gift House. Belleek bowl features the embossed shamrock lace motif along with hand painted green shamrocks. Shamrock trellis bowl from Belleek is crafted of fine china that features hand painted shamrocks along with an embossed motif.